USS Nimitz (CVN-68) is a supercarrier of the United States Navy, and is the lead ship of her class. She is one of the largest warships in the world. She was laid down, launched and commissioned as CVAN-68 but was redesignated CVN 68 (nuclear-powered multimission aircraft carrier) on 30 June 1975 as part of the fleet realignment of that year. The ship was named for World War II Pacific fleet commander Chester W. Nimitz, who was the Navy’s third fleet admiral. Unlike all subsequent Nimitz class aircraft carriers, Nimitz only uses her namesake's surname as is common for military officers. She is also the first carrier of her class and the most recent supercarrier not to be named for someone who held elected office in the United States. Nimitz was homeported at Naval Station Norfolk until 1987, when she was relocated to Puget Sound Naval Shipyard in Bremerton, Washington. Following her Refueling and Complex Overhaul in 2001, her homeport was changed to NAS North Island in San Diego, California. Nimitz home port was again changed to Everett, Washington in 2012. 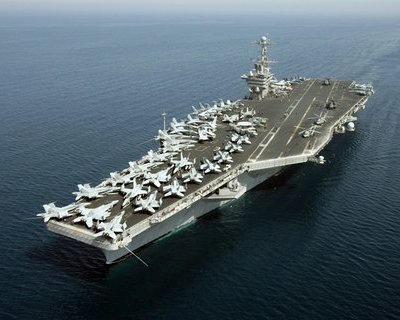 USS Dwight D. Eisenhower (CVN-69) ("Ike") is an aircraft carrier currently in service with the United States Navy. Commissioned in 1977, the ship is the second of the ten Nimitz-class supercarriers currently in service, and is the first ship named after the thirty-fourth President of the United States, Dwight D. Eisenhower. The vessel was initially named simply as USS Eisenhower, much like the lead ship of the class Nimitz, but the name was changed to its present form on 25 May 1970. The carrier, like all others of her class, was constructed at Newport News Shipbuilding Company in Virginia, with the same design as the lead ship, although the ship has been overhauled twice to bring her up to the standards of those constructed more recently. Since commissioning, Eisenhower has participated in deployments including Operation Eagle Claw during the Iran hostage crisis in 1980, as well as the Gulf War in the 1990s, and more recently in support of US military operations in Iraq and Afghanistan. Besides deployments in Operation Desert Strike, Operation Iraqi Freedom, Operation Southern Watch, and Operation Enduring Freedom, the Carl Vinson was involved in a number of notable events. The body of Osama bin Laden was disposed of in 2011 from the deck of the Carl Vinson, and that same year, on November 11, she played host to the first NCAA basketball game on an aircraft carrier, between North Carolina and Michigan State. USS Theodore Roosevelt (CVN-71) (also known by crewmembers as "the Big Stick" or within the navy simply as TR) is the fourth Nimitz-class supercarrier. Her radio call sign is Rough Rider, the name of President Theodore Roosevelt's volunteer cavalry unit during the Spanish-American War. She was launched in 1984, saw her first action during Operation Desert Storm in 1991, and is currently homeported at Newport News Shipyard, Virginia. USS Abraham Lincoln (CVN-72), is the fifth Nimitz-class supercarrier in the United States Navy. It is the second Navy ship named after former President Abraham Lincoln. Her home port is Norfolk, Virginia, and she is a member of the United States Atlantic Fleet. She is administratively responsible to Commander, Naval Air Forces Atlantic, and, operationally, she is currently the flagship of Carrier Strike Group Nine and host to Carrier Air Wing Two. Harry S Truman was launched on 14 September 1996 by Newport News Shipbuilding, Newport News, Virginia, and commissioned on 18 July 1998 with Captain Thomas Otterbein in command. President Bill Clinton was the keynote speaker, and other notable attendees and speakers included Missouri Representative Ike Skelton, Missouri Governor Mel Carnahan, Secretary of Defense William Cohen and Secretary of the Navy John H. Dalton. USS Harry S Truman was initially the flagship of Carrier Group Two and, beginning 1 October 2004, of Carrier Strike Group Ten. USS George H.W. Bush (CVN-77) is the tenth and final Nimitz-class supercarrier of the United States Navy. She is named for the 41st President of the United States and former Director of Central Intelligence George H. W. Bush, who was a naval aviator during World War II. Bush's callsign is Avenger, after the TBM Avenger aircraft flown by then-Lieutenant George Bush in WWII. Construction began in 2001 at the Northrop Grumman Newport News shipyard and was completed in 2009 at a cost of $6.2 billion. She is homeported at Naval Station Norfolk, Virginia. The Gerald R. Ford-class aircraft carriers (or Ford-class) are a class of supercarrier for the United States Navy, intended to eventually replace the current Nimitz-class carriers. The new vessels will use a hull design very similar to the Nimitz carriers in appearance, but many aspects of the design will be very different, implementing new technologies developed since the initial design of the previous class (such as the Electromagnetic Aircraft Launch System), as well as other design features intended to improve efficiency and running costs, including a reduced crew requirement. The first hull of the line will be named Gerald R. Ford, and will have the hull number CVN-78. Automation, which reduces crew requirements by several hundred from the Nimitz class carrier. The updated RIM-162 Evolved Sea Sparrow missile system. AN/SPY-3 dual-band radar (DBR), as developed for Zumwalt class destroyers. Stealthier features to help reduce radar profile. The ability to launch the F/A-18E/F Super Hornet, EA-18G Growler, C-2 Greyhound, E-2 Hawkeye and the F-35C Lightning II. The US Navy believes that with the addition of the most modern equipment and extensive use of automation, it will be able to reduce the crew requirement and the total cost of future aircraft carriers. The primary recognition feature compared to earlier supercarriers will be the more aft location of the navigation "island." The relocation of the "island" will enable the carrier to sustain 140–160 sorties per day with a surge capability of 220 sorties. PCU Gerald R. Ford (CVN-78) is to be the lead ship of her class of United States Navy supercarriers. As announced by the U.S. Navy on 16 January 2007, the ship will be named after the 38th President of the United States, the late Gerald R. Ford, whose World War II naval service included combat duty aboard the light aircraft carrier Monterey in the Pacific Theater. The keel of the Gerald R. Ford was laid down on 13 November 2009. Construction began on 11 August 2005, when Northrop Grumman held a ceremonial steel cut for a 15-ton plate that will form part of a side shell unit of the carrier. The schedule calls for the ship to join the U.S. Navy’s fleet in 2015. Gerald R. Ford is slated to replace the current USS Enterprise, ending her then 50-plus years of active service with the United States Navy. PCU John F. Kennedy (CVN-79) is a planned United States Navy Gerald R. Ford-class aircraft carrier. The ship is in construction and to be placed in commission in 2020. 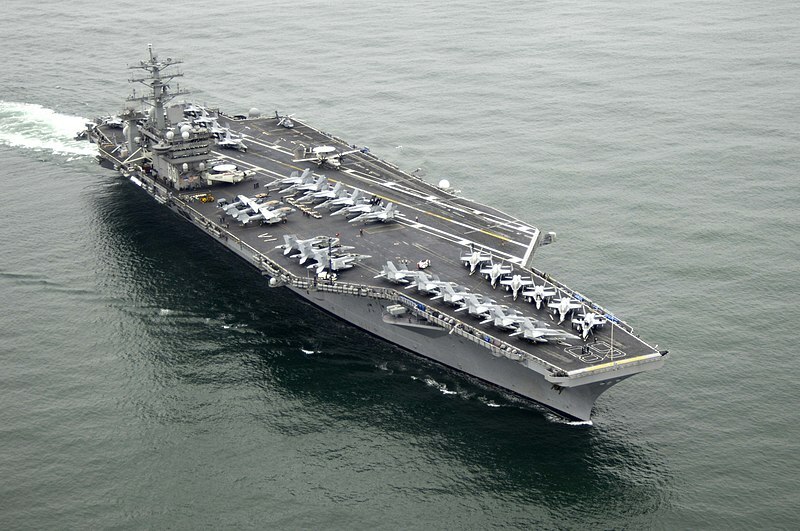 CVN-80 (2025): scheduled to replace Dwight D. Eisenhower (CVN-69). ĐÃ TÌM RA 95/129 CON 'TINH TINH' BÁN RẺ NHÂN DÂN!